Source of Support: The study medication was provided by Abbott Healthcare Pvt Ltd. Authors of this study wish to thank Dr. Anant D. Patil for support in writing and editing the study manuscript, Conflict of Interest: The authors Naik MM and Mukaddam Q are employees of Abbott Healthcare Pvt Ltd. Peripheral neuropathy is a common complication of diabetes which can cause significant morbidity and mortality. At least one of four diabetic patients is affected by distal symmetric polyneuropathy (DSP), which represents a major health problem. Diabetic neuropathy is implicated in 50-75% of non-traumatic amputations. Sensorimotor neuropathy is marked by pain, paraesthesia, and sensory loss. Neuropathic pain affects 16% of diabetic patients and exerts a substantial impact on the quality of life, particularly by causing interference of sleep and enjoyment or quality of life. The pathology of diabetic neuropathy involves oxidative stress, advanced glycation end products, polyol pathway flux, and protein kinase C activation; all contribute to microvascular disease and nerve dysfunction. Hence while treating diabetic painful neuropathy, treating just pain will not cure the damaged nerves and decrease the oxidative stress. Methylcobalamin  and Alpha Lipoic Acid (ALA)  have shown some promise in treatment of impaired diabetic neuropathic conditions associated with pain. Combination of methylcobalamin, ALA and pregabalin is available in Indian market. However, their comparative efficacy with pregabaline alone in treatment of diabetic painful diabetic neuropathy is not known. The study was conducted to evaluate whether methylcobalamin and ALA added to pregabalin provides additional benefit for pain relief compared to pregabalin alone in type 2 diabetes patients with impaired peripheral neuropathic condition associated with pain. This was an open, randomized, and controlled, parallel group 12-week pilot study conducted at a single centre in Chennai, Tamilnadu, India. Patients of both gender, >18 years of age with diagnosis of type 2 diabetes mellitus (T2DM) as per the criteria of American Diabetes Association (ADA),  with glycosylated hemoglobin (HbA1C) ≤11% and presenting with symptoms of impaired peripheral neuropathy were screened for eligibility in the study. Impaired peripheral neuropathy was defined by bilateral decreased or absent reflexes at the ankles, or bilateral decreased vibration, pinprick, fine touch or temperature perception in the distal lower extremities; and confirmed by nerve conduction velocity (NCV) studies. All patients had pain associated with diabetic neuropathy for ≥6 months, and completed at least 1 daily pain diaries during screening phase and had a minimum average daily pain score of 4 on an 11-point (0-10) numerical rating scale (NRS). Patients willing to follow the study related procedures were enrolled. Patients with prior therapy with pregabalin, and having any other neurologic disorders unrelated to diabetic neuropathy were excluded. Those with known renal dysfunction (serum creatinine >1.5 mg%); hepatic abnormality (serum total bilirubin >2.5 mg%), existing chronic hepatitis B infection, or hepatitis B within previous 3 months, or HIV infection; having respiratory, or hematologic abnormalities were also excluded. Patients with unstable coronary vascular disease (CVD), symptomatic peripheral vascular disease (PVD), and those having abnormal ECG or 2-min rhythm strip at screening were not enrolled in the study. Pregnant and lactating women were excluded from participating in the study. The study protocol, case record form, informed consent forms, and the subject information sheet were reviewed and approved by the Independent Ethics Committee. This study was conducted in compliance with the ethical principles according to the Declaration of Helsinki (revised Edinburgh, 2000) and in compliance with International Conference of Harmonization (ICH) Good Clinical Practices (GCP). Written informed consent was obtained prior to the subject entering the study (before initiation of protocol-specified procedures). A total of 30 patients were screened for eligibility in the study. After satisfying the eligibility criteria and obtaining informed consent, all the 30 patients were randomly assigned to the treatment based on a pre-determined computer-generated randomization code. The randomization codes were prepared by a statistician and provided to the investigator in a sealed envelope separately for each patient. The enrolled patients were assigned a serial number and the randomization code envelop for the serial number was opened to reveal the randomization code. 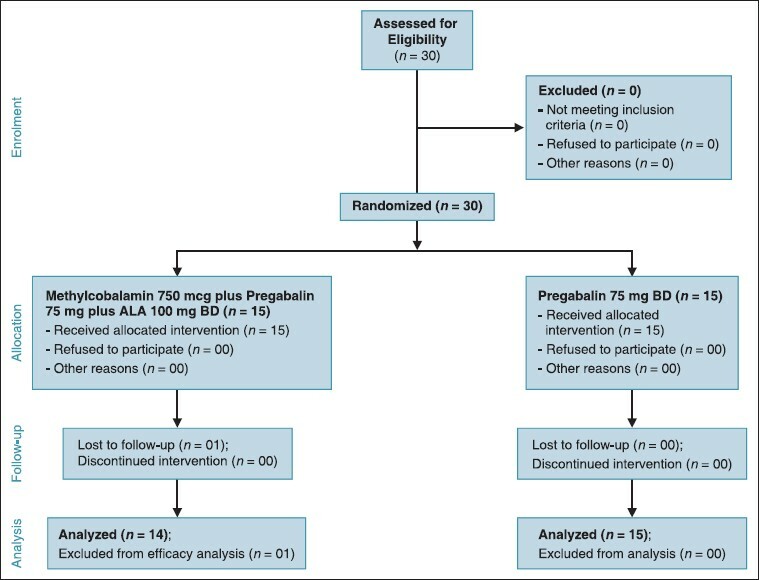 Enrolled patients were randomized (1:1) to receive either a tablet containing Pregabalin 75 mg, Methylcobalamin 750 μg, and ALA 100 mg (PMA, n = 15); or tablet containing Pregabalin 75 mg (PG, n = 15) [Figure 1]. Both treatments were administered twice every day, orally for a period of 12 weeks. Laboratory investigations for lipid profile were done in all patients at screening. Use of analgesics other than acetyl salicylic acid (325 mg/d for prophylaxis of MI and TIAs), acetaminophen, antidepressants, anti-epileptic drugs, neuroleptics, or any concomitant medication that could alter effect of study treatment were prohibited during the study. Methylcobalamin, pyridoxine, ALA, and other B complex preparations were also prohibited during the study period. After screening, a washout period of 4 weeks was given for patients taking prohibited medications. Pain intensity is commonly reported using NRS in clinical trials. An eleven point NRS (0-no pain and 10-worst possible pain), was used for assessment of improvement in pain in this study. Patients recorded their pain during the previous 24-hour period by circling the appropriated number on a 11-point (0-10) NRS where '0' was no pain and '10' was worst possible pain. The assessments were made at baseline on screening, and then after 4 weeks and 12 weeks. Primary efficacy assessment variable was the change in pain scores from baseline to week 12. The pain assessment was done at screening (baseline score) and then after 4, and 12 weeks of therapy. Secondary efficacy assessments included improvement in NCV at 12 weeks, improvement in sleep interference scores (SIS), response rate to pain, and global assessment for the usefulness of therapy. The NCV was assessed for both sides (right and left) using the standard Medicaid EMG/EP machine. Motor nerve conduction parameters including Compound Muscle Action Potential (CMAP) amplitudes, distal and proximal latency and motor conduction velocity were measured in common peroneal and posterior tibial nerves. F wave latencies and dispersion were also studied in the same nerves. Sensory conduction studies included measurement of onset latencies and peak to peak amplitude of SNAPs and CVs in the sural and superficial peroneal nerves after averaging 20 artifact free potentials. Constancy of room temperature at 32°C and careful measurement of distances were ensured in all subjects. Stimulating and recording parameters were kept constant in all subjects to ensure adequate uniformity in study procedure. The change and percent change in NCV from baseline to week 12 was calculated; the latency and amplitude for the nerves were also measured. The Superficial Peroneal Nerve (SPN) and Sural Nerve (SN) were the sensory nerves assessed, whereas the motor nerves assessed included Posterior Tibial Nerve (PTN) and Common Peroneal Nerve (CPN). The sleep interference was assessed based on a 11-point (0-10) rating scale where '0' was pain did not interfere with sleep and '10' was unable to sleep because of pain. The change in SIS recorded on the patient diaries by patients from baseline to week 12 was calculated. The SIS assessment was done at screening (baseline score) and then after 4, and 12 weeks of therapy. Response to pain, defined as ≥50% reduction in mean pain score from baseline to end of 12 weeks was compared between the study groups. Global assessment was done for the usefulness of therapy separately by patients and investigator independently after 12 weeks of study period on a 5-point rating scale of '1', poor (no change in symptoms of neuropathy); '2', satisfactory (disappearance/decrease by 25-50% of all symptoms); '3', good (disappearance/decrease by 50-70% of all symptoms); '4', very good (disappearance/decrease by 71-90% of all symptoms); and '5', excellent (disappearance/decrease by more than 90% of all symptoms). Safety assessment included any adverse events reported by the patients during the study, clinical laboratory, general medical and neurologic examinations. Compliance was assessed based on the tablet count during each follow-up visits. Compliance was defined as consumption of more than 80% of the tablets as per the treatment schedule. Efficacy analyses were done on patients who completed the study as per protocol, i.e. per-protocol (PP) population, whereas safety analyses were done on intent-to-treat (ITT) population of 30 patients. The data for scores for pain (NRS), NCV and SIS is expressed as mean and SEM. Change from baseline is expressed as mean change and percentage change from baseline. The change from baseline in the NCV is analysed using One-Way ANOVA (repeat measures) with visit time as a factor, whereas between group comparisons were done using unpaired 't' test. The change from baseline in the NRS and SIS is analysed using Friedman test, whereas between group comparisons were analysed using Mann-Whitney 'U' test. Discrete data (responder rate and adverse events) was analysed using Chi Square test. All analyses were made at alpha 0.05 (95% C.I.). Data of all 30 patients (ITT population) was evaluated for safety analyses, whereas for efficacy analyses data for 29 patients (14 PMA & 15 PG) was used (PP population). One patient from study group (PMA) was lost to follow-up at week 12 visit and 29 patients completed the study as per the protocol. [Table 1] shows the demographic and baseline characteristics of the patients. The mean age, duration of diabetes, body mass index (BMI), weight, and gender distribution was similar in both the groups (P, > 0.05). The mean HbA1C (%) was also similar [7.1 (0.1)] in both groups. The baseline NRS scores for pain for the two treatments [Table 2] were similar (P, 0.652). There was a significant reduction in the NRS after 12 weeks of therapy with both treatments [Figure 2] (P < 0.05). 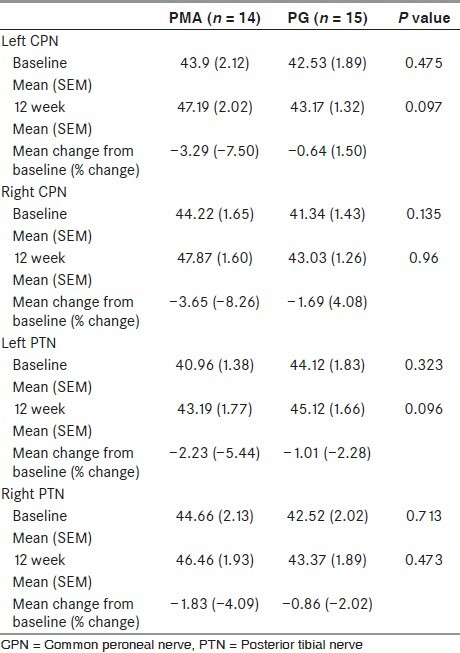 Individual comparison shows similar percentage change in the NRS from baseline at 4 weeks (P, 0.809) and 12 weeks (P, 0.918) for the two treatment groups [Table 2]. The baseline scores for sleep interference [Table 3] for the two treatments were similar (P = 0.782). 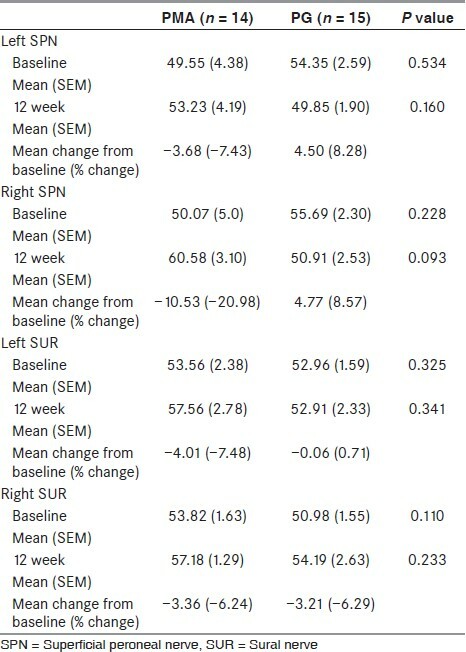 There was a significant reduction in the SIS after 12 weeks of therapy with both treatments [Figure 3] (P < 0.05). 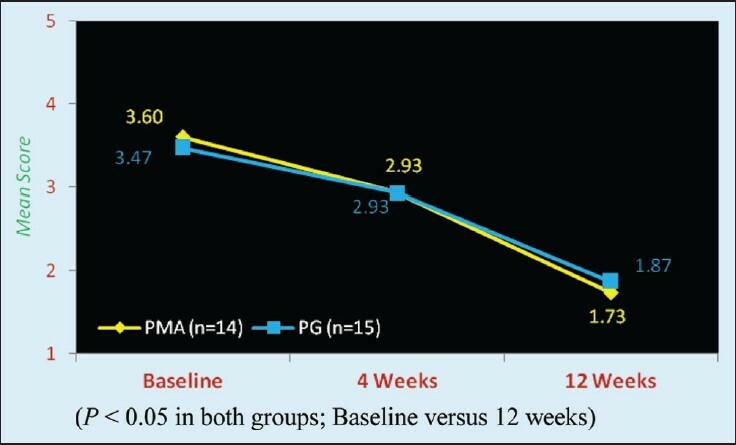 The percent change in the SIS score from baseline at 4 weeks (P, 0.814) and 12 weeks (P, 0.092) was greater with the PMA group compared to PG group, although the difference between the two groups was not significant [Table 3]. [Table 4] and [Table 5] shows the NCV for sensory and motor nerves at baseline and the change from baseline (mean and % change) after 12 weeks in the two treatment groups. No significant difference between groups was seen in any of the parameters. 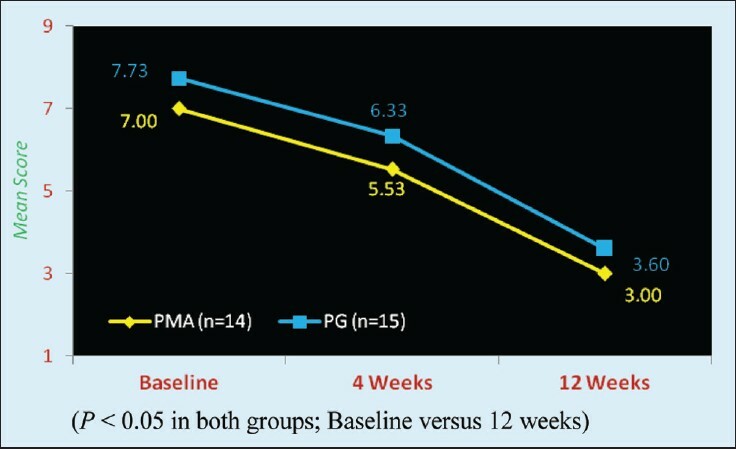 However, mean NCV of left common peroneal nerve showed significant improvement in PMA group at week 12 compared to baseline (P = 0.018). Similarly, for right common peroneal nerve both groups showed significant improvement. (PMA P = 0.002, PG, P = 0.007). For sensory testing, at week 12, right superficial peroneal nerve showed significant reduction in nerve conduction velocity in PG group compared to baseline (from 55.69 to 50.91 m/s; P = 0.043). At 4 weeks the responder rate was 7.14% with PMA and was nil with PG , whereas at 12 weeks the response rate with PMA was 78.57% (11/14) and with PG it was 66.67% (10/15), Thus, the response rate for NRS for pain was better with the combination therapy as compared to pregabalin monotherapy, however, the difference was not significant at 4 (P, 0.062) and 12 weeks (P, 0.886). At the end of therapy, global assessment by patient show a greater number of patients being rated as excellent with PMA (35.71%) compared to PG alone (20%). Similarly, global assessment by investigator show a greater number of patients being rated as excellent with PMA (28.57%) compared to PG alone (20.00%). There were no significant differences (P > 0.05) in terms of rating by patient and physician at the end of 12 weeks. For none of the patients the combination therapy was rated as having poor tolerability. In most of the efficacy parameters, difference could not reach statistical significance due to the small sample size. No adverse events were reported by any of the patients during the study period. A multicenter randomized double-blind study evaluated efficacy and safety of ALA over 4 years in mild-to-moderate diabetic distal symmetric sensorimotor polyneuropathy (DSPN). Though treatment with ALA did not influence the primary composite end-point ((Neuropathy Impairment Score [NIS]-Lower Limbs [NIS-LL] and seven neurophysiologic tests), it showed clinically meaningful improvement and prevention of progression of neuropathic impairments. ALA was well tolerated over 4 years. Methylcobalamin has been shown be useful in Bell's palsy,  protect against glutamate-induced neurotoxicity in the cultured retinal neurons  and also promote regeneration of motor nerve terminals in mouse and thus, could benefit diabetic neuropathy. A systemic review has reported some promise for methylcobalamin in treatment of diabetic neuropathy. Adding methylcobalamin and ALA to pregabalin in treatment of diabetic painful neuropathy may reduce pain, help in repair the nerve function and decreasing the oxidative stress. Neuropathies are characterized by a progressive loss of nerve fibers that can be assessed non-invasively by several tests of nerve function, including nerve conduction studies and electromyography, quantitative sensory testing, and autonomic function tests. This study used NCV as a parameter to assess the nerve function for both sensory and motor peripheral nerves. In our study, significant improvement was reported in the NCV and sleep interference with both combination therapy as well as pregabalin monotherapy. The improvement in the NCV was better with the combination therapy compared to pregabalin alone, although not significant. Findings of our study suggest that combination of methylcobalamin and ALA with pregabalin is effective in improving the symptoms of neuropathy and also improve the nerve function. Because of the small sample size, most of the efficacy parameters, could not reach statistical significance; hence, the benefit of the 3-drug-combimation should be interpreted with great reservation. This study has a number of limitations, including an open-label design and small sample size. An open-label study design does not include blinding which may introduce assessment bias. Large, randomized, double-blind studies are required to explore the benefits of adding of methylcobalamine and ALA to pregabalin for improving efficacy in neuropathic pain. MAINTAIN study shows that the addition of methylcobalamin and ALA to pregabalin improves the efficacy of pregabalin in improving the symptoms of neuropathy and also improve the nerve function as observed by the increase in the nerve conduction velocity. MAINTAIN study might be one of the few or the only study to show that the methylcobalamin and ALA improve diabetic peripheral neuropathic conditions as assessed by improvement in NCV and pain scores. However, further studies of larger sample and blinded nature are needed to substantiate this effect. 1. Galer BS, Gianas A, Jensen MP. Painful diabetic polyneuropathy: Epidemiology, pain description, and quality of life. Diabetes Res Clin Pract 2000;47:123-8. 2. Harati Y. Diabetes and the nervous system. Endocrinol Metab Clin North Am 1996;25:325-59. 3. Boulton AJ, Vinik AI, Arezzo JC, Bril V, Feldman EL, Freeman R, et al. American Diabetes Association. Diabetic neuropathies: A statement by the American Diabetes Association. Diabetes Care 2005;28:956-62. 4. Young MJ, Boulton AJ, MacLeod AF, Williams DR, Sonksen PH. A multicentre study of the prevalence of diabetic peripheral neuropathy in the United Kingdom hospital clinic population. Diabetologia 1993;36:150-4. 5. Pirart J. Diabetes mellitus and its degenerative complication: A prospective study of 4,400 patient observed between 1947 and 1973. Diabetes Care 1978;1:168-88. 6. Akaike A, Tamura Y, Sato Y, Yokota T. Protective effects of a vitamin B12 analogue, methylcobalamin, against glutamate cytotoxicity in cultured cortical neurons. Eur J Pharmacol 1993;241:1-6. 7. Ziegler D, Reljanovic M, Mehnert H, Gries FA. Alpha-lipoic acid in the treatment of diabetic polyneuropathy in Germany: Current evidence from clinical trials. Exp Clin Endocrinol Diabetes 1999;107:421-30. 8. American Diabetic Association. Diagnosis and classification of diabetes mellitus. Diabetes Care 2004;27 (suppl 1): S5-10. 9. Kimura J. Electrodiagnosis in diseases of nerve and muscle: Principles and Practice Philadelphia: FA Davis; 1989. 10. Boulton AJ, Malik RA. Diabetic neuropathy. Med Clin North Am 1998;82:909-29. 11. Ryle C, Donaghy M. Non-enzymatic glycation of peripheral nerve proteins in human diabetics. J Neurol Sci 1995;129:62-8. 12. Greene DA, Arezzo JC, Brown MB. Effect of aldose reductase inhibition on nerve conduction and morphometry in diabetic neuropathy. Zenarestat Study Group. Neurology 1999;53:580-91. 13. Harati Y, Gooch C, Swenson M, Edelman S, Greene D, Raskin P, et al. Double-blind randomized trial of tramadol for the treatment of the pain of diabetic neuropathy. Neurology 1998;50:1842-6. 14. Ziegler D, Ametov A, Barinov A, Dyck PJ, Gurieva I, Low PA, et al. Oral treatment with alpha-lipoic acid improves symptomatic diabetic polyneuropathy: The SYDNEY 2 trial. Diabetes Care 2006;29:2365-70. 15. Vallianou N, Evangelopoulos A, Koutalas P. Alpha-lipoic Acid and diabetic neuropathy. Rev Diabet Stud 2009;6:230-6. 16. Skalská S, Kucera P, Goldenberg Z, Stefek M, Kyselová Z, Jariabka P, et al. Neuropathy in a rat model of mild diabetes induced by multiple low doses of streptozotocin: Effects of the antioxidant stobadine in comparison with a high-dose alpha-lipoic acid treatment. Gen Physiol Biophys 2010;29:50-8. 17. Ziegler D, Low PA, Litchy WJ, Boulton AJ, Vinik AI, Freeman R, et al. Efficacy and safety of antioxidant treatment with alpha-lipoic acid over 4 years in diabetic polyneuropathy. The NATHAN 1 trial. Diabetes Care 2011;34:2054-60. 18. Jalaludin MA. Methylcobalamin treatment of Bell′s Palsy. Methods Find Exp Clin Pharmacol 1995;17:539-44. 19. Kikuchi M, Kashii S, Honda Y, Tamura Y, Kaneda K, Akaike A. Protective effects of methylcobalamin, a vitamin B12 analogue, against glutamate-induced neurotoxicity in retinal cell culture. Invest Ophthalmol Vis Sci 1997;38:848-54. 20. Yamazaki K, Oda K, Endo C, Kikuchi T, Wakabayashi T. Methylcobalamin (methyl-B12) promotes regeneration of motor nerve terminals degenerating in anterior gracile muscle of gracile axonal dystrophy (GAD) mutant mouse. Neurosci Lett 1994;170:195-7. 21. Sun Y, Lai MS, Lu CJ. Effectiveness of vitamin B12 on diabetic neuropathy: Systematic review of clinical controlled trials. Acta Neurol Taiwan 2005;14:48-54.